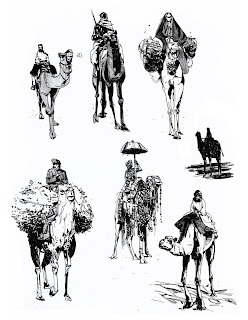 Camel and rider studies for a new painting. Ballpoint pen and pencil. Sorry for all the process work lately and no finals. I literally have a stack of pieces waiting to be finished/tweaked once the academy is finished. Expect them to be posted soon(ish). I'm not liking the sound of that. oooo camel! i want one, but a mean one that spits on people! you've got cool stuff on ur blog! Something about the camel at the bottom right reminds me of an AT-AT from Star Wars. love your process work. keep them coming! I was gonna say! very Sergio Toppi. hey man, you what a tissue? are you kidding, i LOVE looking your process work, maybe even more than at your finals! not that those aren't great, too, but there's something about process and sketches that really gets me. Super cool! Not too many camels in SRQ to ref. The orientalists did some neat painting of silk road type stuff, but mostly very traditional. Can't wait to see you in KC! We'll have a blast.